My Dad hardly eats any greens. I mean he's your standard definition of a guy's guy. Meat and potatoes are right up his alley, as well as beer and cheese. So when he comes across a green vegetable that he likes I think my whole family is shocked. Especially when that green is Brussels sprouts. Granted, he had them in a local restaurant and they were mixed in with bacon and blue cheese, so he was pretty much destined to love them. For my Dad's birthday dinner, I made my own interpretation of the Brussels sprouts side dish he had in the restaurant. 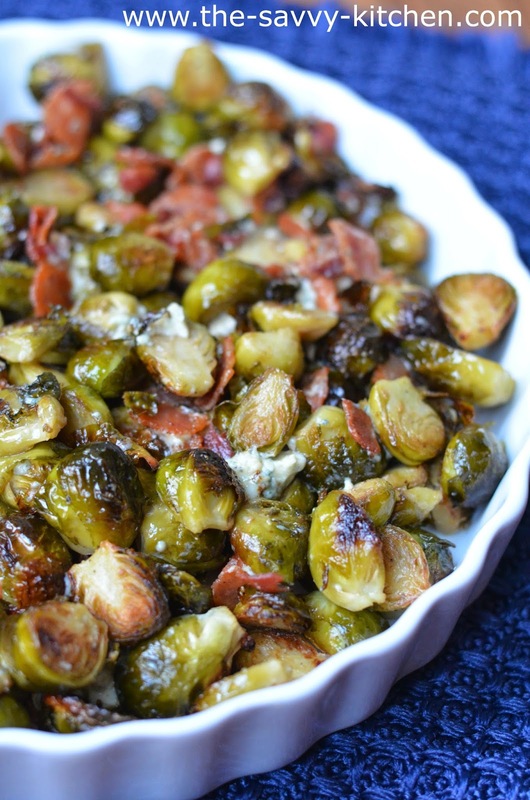 I decided to roast the Brussels sprouts like I normally do, then I just added in some bacon and blue cheese right when they came out of the oven so the blue cheese melted and became a little creamy. The result was nothing short of phenomenal and my whole family enjoyed them. 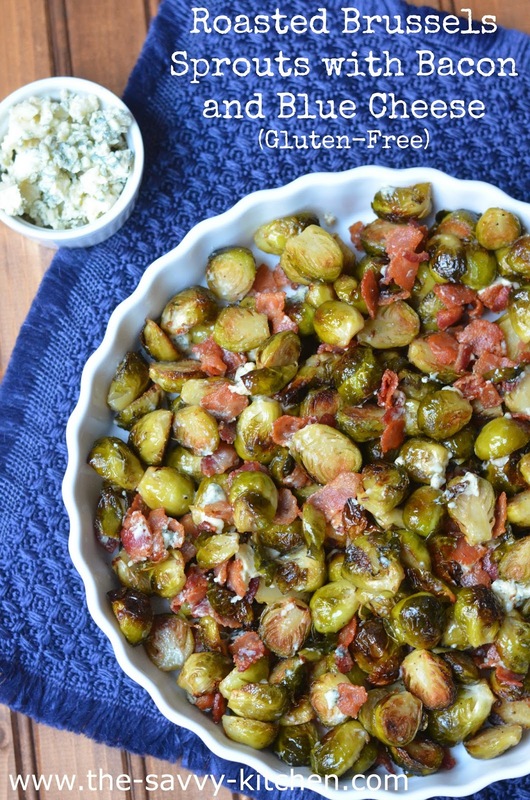 Even the ones that don't normally like Brussels sprouts (my brother), blue cheese (my mom) or *gasp* bacon (my other brother). 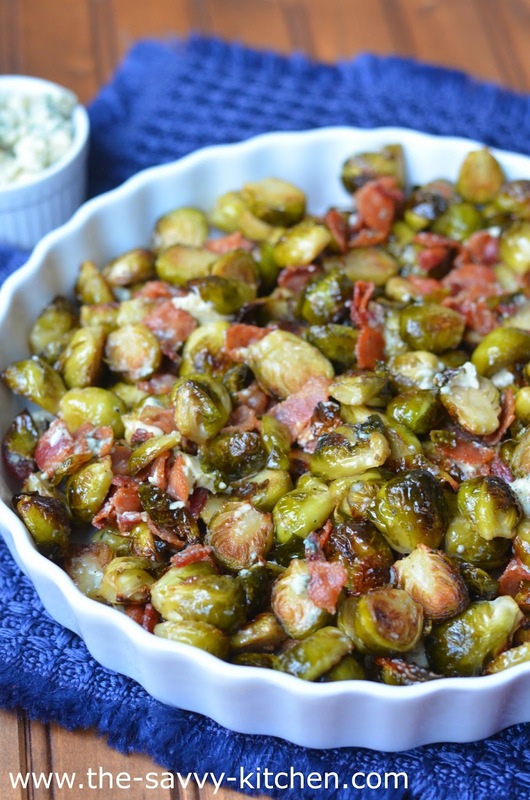 These are a perfect side dish for any occasion, especially Thanksgiving! They can be made ahead and kept warm in the oven. Enjoy! Cut bacon into bite-size pieces. In a large skillet, cook bacon over medium heat until done. Remove from pan with slotted spoon and allow to drain on a paper towel-lined plate. Reserve bacon grease. Meanwhile, cut ends off Brussels sprouts, remove outside leaves and cut in half. Place Brussels sprouts in a bowl. Add 2 tbsp. reserved bacon grease and 1 tbsp. olive oil to the sprouts and stir to combine. Season with salt and pepper. Spread Brussels sprouts in a roasting pan or on a baking sheet in an even layer. Bake for 30 minutes, stirring occasionally so they evenly brown. After 30 minutes, raise the oven temperature to 450 degrees F and cook for an additional 5 minutes or until Brussels sprouts are crispy. Remove from the oven and immediately stir in bacon pieces and crumbled blue cheese. Pour into a serving platter and serve immediately.